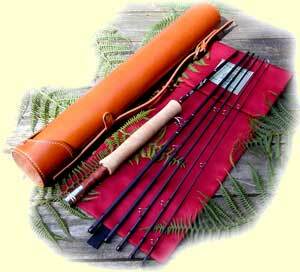 Our Leather fly Rod Cases are produced in top quality Casehide Leathers on a sturdy ABS supporting tube. These cases are hand sewn and come with solid cast brass metal fittings. Our handmade bespoke cases are available with internal diameters of 2.25”, 2.5”, 3” and 4” in lengths of up to 70”. We offer four standard colours, Whiskey tan, Chestnut, dark Burgundy and Black. We also offer a range of standard 3.25” cases in 35”, 45” and 63” lengths, with internal dividers to form 3 compartments. Available in Mid Brown or Light Tan.